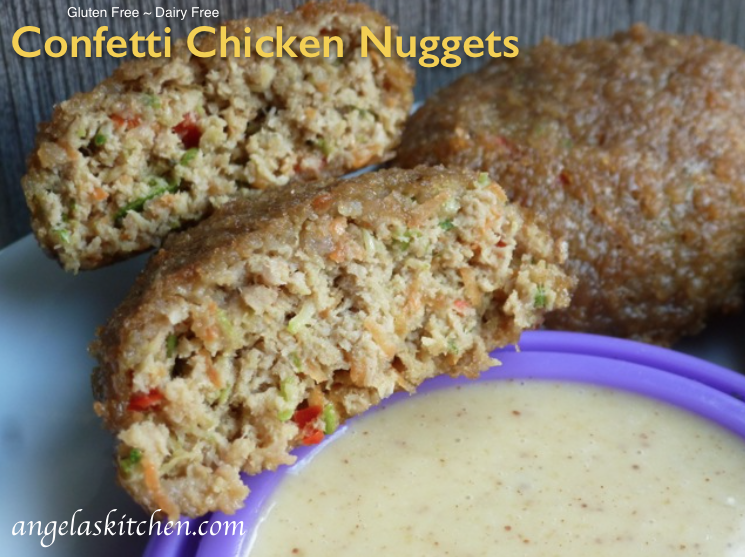 While looking for a fun lunch item to have on hand for my kiddos, we came across this awesome remake of the chicken nugget by Emily of Fuss Free Cooking. I loved everything about it (it is homemade, it has veggies, it is cute and healthy), except the gluten in it. Here is my version of Emily’s recipe made gluten and dairy free and with freezer instructions, because that is how I roll. These were super fun to make with the kids and as one of my kids said, they look like a party inside. 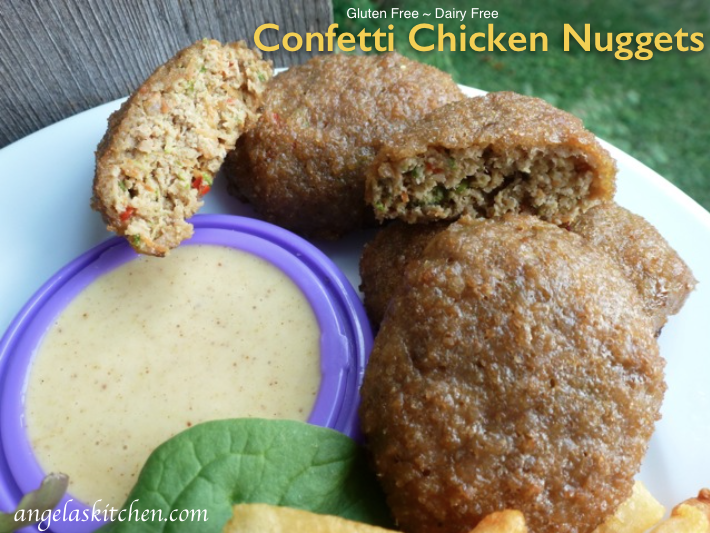 We loved confetti-sprinkle-fun in chicken nugget form! Thanks for the wonderful inspiration, Emily! These are delicious! Line a large baking tray with parchment or silpat. Spritz the parchment with oil. Mix together the ground chicken, zucchini, carrot, egg, rosemary and salt untill well blended. Scoop up about 1 rounded tablespoon of mixture. Shape into a flat oval nugget. If mixture seems too moist to work with (the nugget is falling apart and not holing together), add a bit of potato starch on tablespoon at a time until mixture will hold a nugget shape. Place the crushed gluten free crisped rice cereal into a shallow bowl. Use one hand to shape a rounded tablespoon of mixture into nuggets and place in crushed cereal. With your other hand, sprinkle the cereal crumbs over the nuggets. (This is to prevent the mixture from sticking to your hand in the next step.) Carefully coat the nugget on all sided with the breadcrumbs. Place nuggets on the lined baking sheet. Continue shaping and coating mixture until finished. Spray nuggets with oil. Place baking sheet into the coldest part of the freezer until nuggets are solid. When nuggets are solid, remove from parchment and place into a freezer safe container separated by waxed paper. Seal, removing as much air as possible, label and freeze. 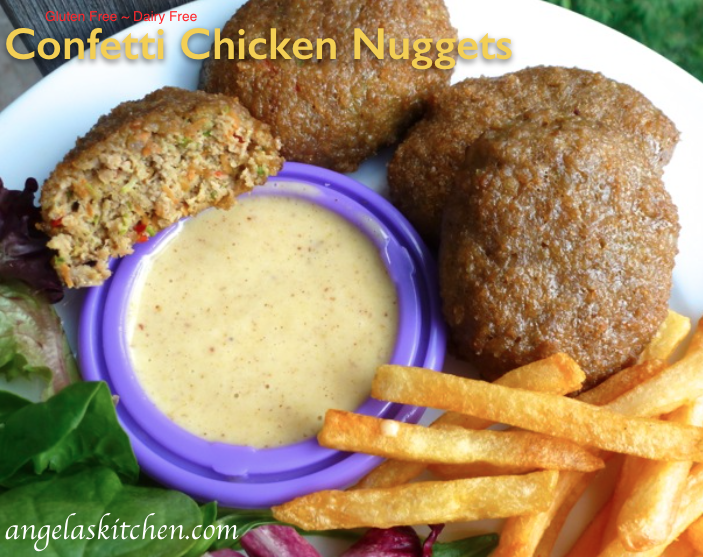 To serve: Place frozen nuggets onto an oiled or silpat lined baking sheet. Bake in a preheated 375 degrees F oven for about 20 minutes until golden and cooked through. Flip nuggets halfway during through their baking time. Note: You can freeze these after baking also. Bake completed uncooked nuggets in a 375 degree oven 15 to 18 minutes until just begining to get golden and are just cooked through. Allow nuggets to cool, then place the baking sheet into the coldest part of the freezer. When firm, place nuggets into a gallon sized freezer bag or freezer safe container, removing as much air as possible, label and freeze. To serve after cooking, thaw and heat through in a 375 degree oven until golden and crisp.